I am spending approximately thirty-six of the approximately 240 hours we have been in the California area in San Diego, crammed into a hotel room with my parents. We are here visiting my twin, the Undercover Brother. I barely slept a wink last night: mom has a cold and cough, poor thing, and dad makes all manner of sleeping noises (snoring, sighing, etc.) 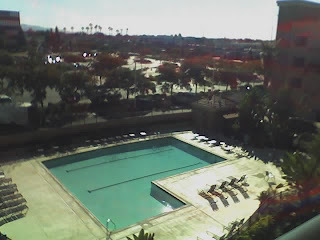 Nevertheless, when I awoke to an 80 degree December morning, I felt like I awoke in heaven. I pulled back the blinds and saw this. We had a leisurely breakfast, then packed into the car and got hopelessly, happily lost in the Gaslamp on the way to this. 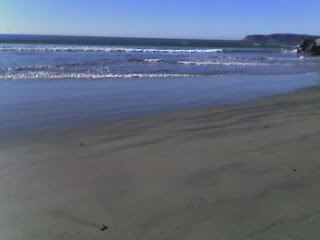 That's the view of the beach from the historic Hotel Del Coronado, where Some Like It Hot was filmed. 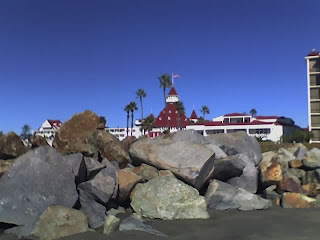 Here's a view of the hotel from the beach. Christmas Eve certainly is different here on the west coast. 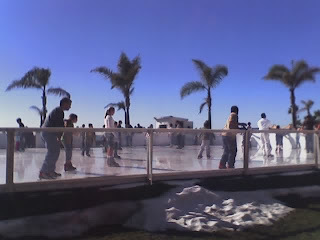 But people still seem excited about doing Christmas-y things, like ice-skating. Only here, they can do that in shorts. 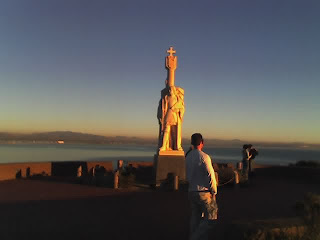 At sunset, we went to the Juan Cabrillo monument, where I captured this picture of the ever elusive Undercover Brother. And this is how we ended our nearly perfect, totally relaxing afternoon.